A Mighty Heart is a 2007 drama film directed by Michael Winterbottom; It is an adaptation of Mariane Pearl's memoir, A Mighty Heart. A Mighty Heart was met with positive reviews from critics and viewers alike. The film was screened out of competition at the 2007 Cannes Film Festival, before being released in North America on June 22, 2007. 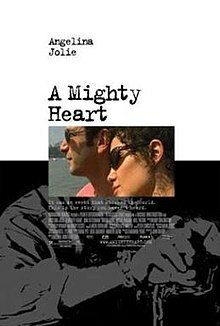 A Mighty Heart is a detailed account of the search for kidnapped Wall Street Journal reporter Daniel Pearl in 2002. Pearl was kidnapped in Karachi by supporters of Omar Sheikh, who claimed responsibility (and was later captured and convicted but is appealing the ruling) for kidnapping and beheading Pearl in 2002. The movie also covers efforts by Pakistan's Security Forces, Department of Justice and the U.S. Department of State's Diplomatic Security Service (DSS) to track the kidnappers and bring them to justice. A Mighty Heart was filmed in France and India, during the summer and fall of 2006. Fearing for the safety of the film crew, the Karachi scenes were shot in Pune, India. However, some of the shots were made at actual locations in Karachi. A Mighty Heart performed poorly at the box office, only earning a total revenue of $18 million compared to its production budget of $16 million. The film opened June 22, 2007 in the United States and Canada and grossed $3.9 million in 1,355 theaters its opening weekend, ranking #10 at the box office. It went on to gross $18,727,125 worldwide. As of December 16, 2007, the film has grossed an additional $5.4 million in DVD/VHS sales and rentals in the United States. The film received positive reviews from critics. The review aggregator Rotten Tomatoes reported that 79% of critics gave the film positive reviews, based on 192 reviews. Metacritic reported the film had an average score of 74 out of 100, based on 38 reviews. Jolie's performance was widely touted by top critics as her finest artistic achievement to date. Both she and the film received a positive review from Roger Ebert. The film was described by Newsweek as "a movie without melodrama or movie-star lighting…allowing Jolie to deliver the most delicate, powerful and human-scale performance of her career." Other favorable reviewers included Peter Travers of Rolling Stone, Justin Chang of Variety and Ray Bennett of The Hollywood Reporter. Marc Mohan of The Oregonian named it the 10th best film of 2007. However, Andrew O'Hehir, film critic for Salon.com, while finding Jolie's performance "restrained and dignified", dismissed the film itself, writing, "it feels like an extra-long episode of 24 with a bad conscience and a bad ending." Entertainment Weekly's Lisa Schwarzbaum felt that Jolie's celebrity was a problem, commenting that "Despite the best of intentions, an actress who makes her own headlines gets in the way of the big picture." Asra Nomani—a colleague of Daniel Pearl who had agreed to participate in the film—stated that the film failed to portray Pearl as a journalist, doing his job, in favor of creating a dramatic arc of "ordinary heroes". She believes Pearl would have "rolled his eyes" at that description. Describing her own response to the film, Nomani said, "For me, watching the movie was like having people enter my home, rearrange the furniture and reprogram my memory." The announcement of the casting of Angelina Jolie in the role of Mariane Pearl drew criticism within the African-American community. Orville Lloyd Douglas, a pop critic, has criticized the casting because, he said, "Jolie is white" and Mariane Pearl is "mixed race". In fact, Pearl is the multiracial daughter of an Afro-Chinese-Cuban mother and a Dutch Jewish father. Pearl personally chose Jolie to play the lead in A Mighty Heart. In response to casting complaints, Pearl said "I have heard some criticism about her casting, but it is not about the color of your skin. It is about who you are. I asked her to play the role—even though she is way more beautiful than I am—because I felt a real kinship to her. She put her whole heart into it, and I think she understood why we should do this movie. We had something to say that we knew we should say together." On November 27, 2007, the film was nominated for three Independent Spirit Awards including Best Screenplay, Best Actress and Best Picture of the Year. Jolie was nominated for a Golden Globe Award, a Screen Actors Guild Award, and a Critics' Choice Movie Award for best actress. She also received an Outstanding Performance of the Year Award for her performance from the Santa Barbara International Film Festival. SBIFF Executive Director Roger Durling said, "We are honored to celebrate Ms. Jolie in what is arguably one of the most extraordinary female roles of the year". ^ Scott Bowles (2006-10-10). "Jolie and Pitt, with 'Heart'". USA Today. Retrieved 2007-06-07. ^ Agence France Presse (2007-05-04). "Angelina Jolie and Mariane Pearl discuss 'A Mighty Heart'". Turkish Daily News. Archived from the original on 2007-09-30. Retrieved 2007-06-07. ^ "Festival de Cannes: A Mighty Heart". festival-cannes.com. Retrieved 2009-12-20. ^ a b Ray Bennett (22 May 2007). "Review: 'A Mighty Heart'". The Hollywood Reporter. Archived from the original on 2007-09-30. Retrieved 2007-06-16. With the BBC's Gaza correspondent Alan Johnston now missing and believed kidnapped for 70 days and journalists in danger in hotspots worldwide, a film version of Mariane Pearl's book about the search for her husband could not be more timely… the film reflects the dispassionate view espoused by Mariane Pearl, who sees that it is misery that breeds terrorism. Jolie plays her with respect and a firm grasp on a difficult accent influenced by France and Cuba. ^ Joe Strupp (21 June 2007). "'WSJ' Editors Call 'A Mighty Heart' Fair and Accurate". Editor & Publisher. It was an accurate portrayal of the Journal and I think the Journal's people, like [then-foreign editor] John Bussey, who were deeply involved came off well as they should have," said former managing editor Paul Steiger, who recalled he saw the movie recently in a private showing for Journal staffers. "I think Angelina Jolie captured Mariane very, very well." Managing Editor Marcus Brauchli, who took over for Steiger and was national editor at the time of Pearl's death, also believed the film was fair. "I don't feel that the Journal was portrayed badly in the film," he said. "I think we were treated reasonably. Angelina Jolie did a good job of channeling Mariane. ^ "A Mighty Heart Full Production Notes". Archived from the original on 2011-02-15. ^ a b "A Mighty Heart (2007)". Box Office Mojo. Retrieved 2007-11-03. ^ "A Mighty Heart - Rotten Tomatoes". Rotten Tomatoes. Archived from the original on 5 January 2008. Retrieved 2008-01-05. ^ "Mighty Heart, A (2007): Reviews". Metacritic. Archived from the original on 30 December 2007. Retrieved 2008-01-05. ^ Roger Ebert (June 22, 2007). "A Mighty Heart (R)". Chicago Sun-Times. Retrieved November 11, 2009. ^ Sean Smith (25 June 2007). "Angelina Jolie wants to save the world". Newsweek. Archived from the original on July 10, 2010. Retrieved 2007-07-24. ^ Peter Travers. "A Mighty Heart". Rolling Stone. Archived from the original on 20 June 2007. Retrieved 2007-06-16. ^ Justin Chang (21 May 2007). "A Mighty Heart: Cannes Film Festival Review". Variety. Retrieved 2007-06-16. In his first studio venture, Michael Winterbottom coaxes forth a staggering wealth of detail from this terse, methodical account. ^ "Metacritic: 2007 Film Critic Top Ten Lists". Metacritic. Archived from the original on 2008-01-02. Retrieved 2008-01-05. ^ a b Andrew O'Hehir (21 May 2007). "Beyond the Multiplex". Salon.com. Retrieved 2007-06-16. ^ Lisa Schwarzbaum (13 June 2007). "Movie Review: A Mighty Heart". Entertainment Weekly. Archived from the original on 16 June 2007. Retrieved 2007-06-16. ^ Nomani, Asra Q. (2007-06-24). "A Mighty Shame". The Washington Post. ^ "Angelina Jolie sparks casting controversy". 2 August 2006. Archived from the original on 30 November 2007. Retrieved 2007-12-02. ^ Orville Lloyd Douglas (9 June 2007). "Shades of blackface". The New Zealand Herald. Retrieved 2007-06-19. When Angelina Jolie was cast to play Marianne Pearl in the biopic film A Mighty Heart there was an uproar by the African American community. Jolie is white whereas Pearl - widow of journalist Daniel Pearl who was kidnapped and murdered by terrorists in Pakistan in 2002 - is a mixed race woman of Afro-Cuban heritage with her mother Marita Van Neyenhoff being black. ^ Mariane Pearl (August 2006). "The woman who gave me my strength". Glamour magazine. Note: this article is also on the Institute for Jewish & Community Research website (link). ^ Heller McAlpin (2 October 2003). "Collateral Damage". Christian Science Monitor. ^ a b "10 Questions for Mariane Pearl". Time. 2007-06-21. ^ "HOLLYWOOD FOREIGN PRESS ASSOCIATION 2008 GOLDEN GLOBE AWARDS FOR THE YEAR ENDED DECEMBER 31, 2007". goldenglobes.org. 2007-12-13. Archived from the original on 2007-12-15. Retrieved 2008-01-05. ^ "People's Choice Awards Past Winners: 2008". PCAvote.com. Sycamore Productions. Archived from the original on 2007-12-28. Retrieved 2008-01-10. This page was last edited on 5 February 2019, at 18:38 (UTC).